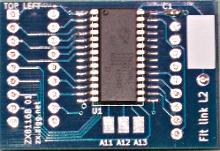 This module is designed to be fitted inside a ZX81 in place of the original RAM IC(s). It can be connected to provide up to 16K of RAM. It is activated by the ZX81's RAMCS signal, in the same way as the standard internal RAM. This means that any peripheral that inhibits this signal to present itself in some or all of the address space normally occupied by internal RAM should function normally when connected to a ZX81 that has this module fitted. This module is designed for issue 1 ZX81s. However, with a little extra effort it can be fitted to an issue 3 ZX81. Please refer to the installation instructions for full details. For fitting to an issue 3 ZX81, all the connecting pins on the right hand half of the module must be absent. You can de-solder and remove them or at the time of purchase request a module that has not had these pins fitted. Do this by entering a note in the instructions to seller field if you use PayPal or indicate this is what you want when you request to make payment. For larger quantities or to combine with an order for ZX Spectrum RAM modules, please request a quote. Prices for quantities of one or two are shown in the table below. For other quantities please request a quote via the form at the bottom of this page. You may pay by PayPal or transfer of funds to a UK bank account. In the latter case, please submit your address and order quantity via the form below and further instructions will be sent to you. Prices include delivery and VAT where required. The modules are sold by Ziggurat Communications Ltd, a company registered in England & Wales. Items are normally dispatched within three working days of receipt of payment. Repair, replacement or refund will be offered for any module that fails within one year of its purchase, provided the instructions (linked above) are followed and it is not mistreated.